Chicken John is selling his famed warehouse. 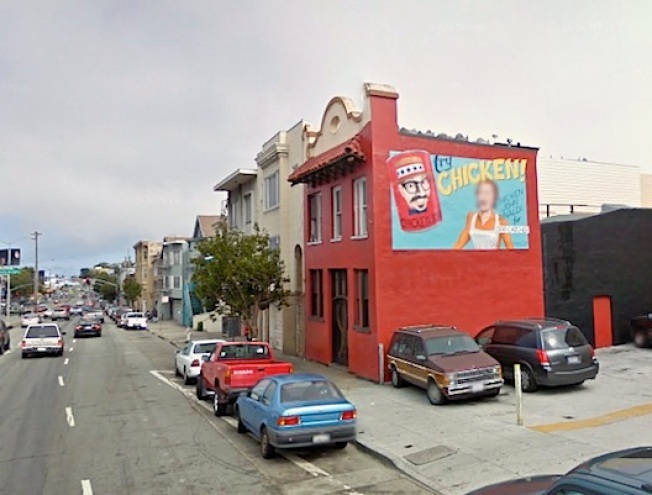 A legend on the market: Chicken John, onetime mayoral candidate and general rabble-rouser, is selling his famous warehouse on the Mission/Bernal Heights border. The 2,800-square-foot building's got — in addition to the Google-blurred Chicken John mural seen above — a roof deck with hot tub and a "huge" open kitchen. Via Laughing Squid, Chicken John speaks: "I’m caught in the mortgage crisis by association. I took a 5 year arm mortgage with a balloon payment thinking I could re-finance. There are no loans today for Showman with non-conforming warehouses. So it goes on the block. Hell, I’ll even finance it….." Ouch by association. Asking price: $899,000. Worth it for the mural alone, obviously.